Most movies would fade to black at this point, ending on this sunny note of optimism. 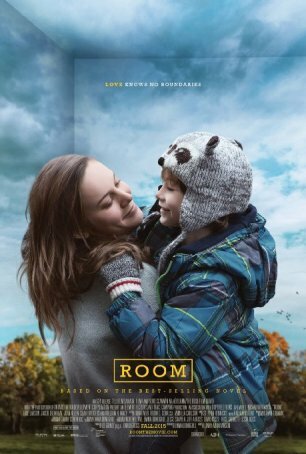 But Room, from a screenplay by Emma Donoghue based on her novel, is less than half over. Because, although the film is in part about the experience of living in this state, it’s much more about what happens after: the post-kidnapping assimilation, the return to a normality in which the commonplace aspects of life and living seem strange and, at times, ominous. Room is (like the book) presented from Jack’s point-of-view. He’s a bright, inquisitive boy but his worldview has been shaped by the circumstances in which he has been raised. His Ma has done her best to shield him from the cruelty of his situation by shaping his life in “room” as ordinary. He knows nothing but the inside of an outdoor shed with a skylight in the roof. He believes that everything beyond the walls is outer space, that “Old Nick” (his father) comes by magic, and that nothing he sees on television is real. Jack, as it turns out, is better able to adapt to “freedom” than his mother. She is haunted by memories, plagued by doubts. We see this, but only as filtered through Jack’s perspective. For the first half of Room, Ma is the lead character in this drama. In the outside world, however, as Jack gradually asserts an element of independence, Ma’s role in his life is reduced. She becomes a supporting figure. The extremity of the situations italicizes a universal truth that occurs even in ordinary families: it’s always harder for the parent to let go than for the child to do the same. That’s not to say Jack’s connection with his mother isn’t close or that he doesn’t love her, but he isn’t as invested in the suffocating bond as she is. He can let go, although with difficulty; she cannot. It’s a fascinating dynamic and director Lenny Abrahamson presents it with consummate skill. Unforced acting goes a long way toward making Room work. This is, after all, mostly about characters and only secondarily about narrative. Soon-to-be Oscar nominee Brie Larson gives the strongest performance of a young career littered with shining moments. She portrays Joy not as a woman straining to do what many of us would deem impossible, but as “Ma” - her son’s image of her. That’s a tricky thing to do - allowing the audience to see and understand the character when aspects of her situation are obscured by what Jack sees. As the five-year old, Jacob Tremblay offers a portrayal free of the affectations and artifice that often characterize child acting. His work is natural, unforced, and entirely believable. Joan Allen, William H. Macy, and Tom McCamus provide support as family members. The psychology explored in Room is complex - it’s similar to what deprogrammed cultists and released long-term prisoners experience. Abrahamson illustrates it in ways that are at times overt and sometimes subtle. The overall effect is powerful. However, as keenly as we are aware of the damage done to Joy by her experience, she comes across as a heroic figure whose sacrifices and determination not only keep her son secure during what is for her a harrowing experience but also support his transition from the safety of “room” to the frightening “real world.” Room is honest and challenging but it’s more uplifting than one might expect from a film with such a horrific backstory.